(CNN) – Firebrand Republican Rep. Steve King announced his intention Friday to file a lawsuit against President Barack Obama, calling unconstitutional the administration's plan to stop deporting some young, illegal immigrants who entered the U.S. as children. "This is no longer a debate about immigration policy. 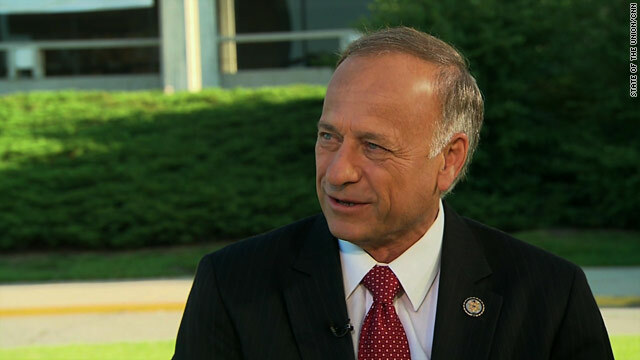 The debate is now about the Constitution and the Rule of Law," the Iowa congressman said in a statement. "I am preparing to bring suit against the President and ask for a court to enjoin him from implementing his unconstitutional and unlawful policy." Obama's plan would apply to people under age 30 who entered the country before the age of 16, pose no criminal or security threat, and were successful students or served in the military. They can apply for a two-year deferral from deportation and if accepted would then have the possibility of working legally, Homeland Security Secretary Janet Napolitano said Friday. The president said the policy "is not amnesty" nor "immunity" or "a path to citizenship." But King and other Republicans described it as a form of amnesty. "Americans should be outraged that President Obama is planning to usurp the Constitutional authority of the United States Congress and grant amnesty by edict to 1 million illegal aliens," he said in an earlier statement. "There is no ambiguity in Congress about whether the DREAM Act's amnesty program should be the law of the land. It has been rejected by Congress, and yet President Obama has decided that he will move forward with it anyway. President Obama, an ex constitutional law professor, whose favorite word is audacity, is prepared to violate the principles of Constitutional Law that he taught." Bottom line, as "W" put it, the President is the "decider in chief". Thank you Mr. President. This is the right thing to do. Because of idiots like this, the Republican Party has lost the Latino vote for generations. Want to bet. Not the Latino's that have come to this country the legal way. OMG!! Yes let's waste more tax pay dollars on baseless lawsuits. The hypocrisy is sickening!!!!!!!!!!!!!!!!!!!!!!!! This lawsuit by Rep. Steve King is a lot easier on the hard working taxpayers wallet than supporting illegal aliens.........I'm behind you 1000% Rep. Steve King just like millions and millions of Americans. This is why Ronmey will lose. Americans are waking up to this GOP/Repub gestapo krap. Vote them all out of office. Republicans will be a disenfranchised party in 20 years. Repubs, you can not discriminate against an American group of people in the states, whether it be Latinos, Gays, Women, Blacks, etc and expect them to vote for you in the General election. "A four-person crew of immigrant workers can pick and box more than 250 crates of tomatoes in a day, Spencer said, or enough for each person on the crew to earn about $150 at the height of the harvest. A 25-person team of citizens recently picked and processed about 200 boxes in a day, he said, earning each member only $24. Spencer said the people weren't in good enough physical condition to work harder or longer hours and typically gave up when faced with acre after acre of tomato plants ready to be picked. Supporters of the law say it will help reduce unemployment by freeing up jobs now held by illegal immigrants and Alabama's most recent jobless rate was 9.9 percent, but Spencer said he is ready to give up trying to find unemployed citizens to help with the harvest." This may help Obama in some of the swing states that have large populations of Hispanics........But it is going to DESTROY Obama in all other states.....This is especially true if Romney and the superpacs begin to run ads saying......."There are millions of US citizens without jobs....Obama is not worried about the millions of US citizens without jobs.....he is worried about providing jobs to millions of illegals that should not even be in our country". The majority of Independents and Republicans have made it clear in all state/national polls regarding illegals-–they do NOT want illegals granted any kind of amnesty. Just watch the polls in about 2 weeks!!! Thank you Obama for handing the presidency to Romney!! Go President Obama! 4 more years! Give it up loser, King. So now he is falling back on the Constitution. Wow! Really? When it's convenience isn't it. Wow! Looks like Obama woke up the congressional republicans from their deep and comatose sleep. This is why I declared independent a long time ago, its fairly obvious to anyone not wearing partisan sunglasses that this was a political stunt to get Latino votes, even if by doing so only hurts the unemployed and underemployed Americans even more by adding nearly a million more people competing against them to get a job. Thank you Rep. King!!! What Obama is doing is beyond ANY understanding and needs to be STOPPED AT ONCE! OBAMA NEEDS TO BE TRIED FOR TREASON, FOR WORKING THE MEXICAN GOVERNMENT IN-ORDER TO TURN OUR ONCE GREAT COUNTRY INTO A 3RD WORLD COUNTRY. That's a bunch of HOT AIR coming from one person – And what "American People" are you talking about? I bet you don't even know the rules behind trying someone for treason!!! The Republican HATERS are going to HATE no matter what! They will not work with President Obama so the president must do what he gotta do without them..............PERIOD!!! Maybe we should do a check of all the farmers in Iowa to see who is hiring illegals for agricultural work? Why not arrest those farmers and when we see them doing the "perp walk" from the squad car we'd send a message. How about the fat-cats with pool boys, maids, cooks and nannies? Why are we only rounding up the immigrants? Right now a group of Republican Congressmen from agricultural states are pushing for relaxed and expidited work permits – because nobody in the U.S. will do that brutal work. We "love" Hispanics when they have a hoe or a shovel in their hands. Reagan didn't unilaterally grant amnesty in 1986. Look up the Simpson-Mazolli Act, the congressional bill that became law. Because that will take care of the legislative gridlock that he has participated in... a good ole lawsuit is always just the way to do it. Forget about working for what he was hired to do. Let's throw some more cash at it. Ronald Reagan passed the Immigration Reform and Control Act in 1986, which eventually granted amnesty to 2.7 million illegal immigrants. The kicker: he continued to speak out for immigration rights after leaving office. Reagan wouldn't pass the Repubs "purity" tests – but that won't stop all these GOP yahoo candidates from invoking St. Reagan's name. Guess they just all figure their base are a bunch of idiots. – required employers to attest to their employees' immigration status. – made it illegal to knowingly hire or recruit unauthorized immigrants. – granted amnesty to certain seasonal agricultural illegal immigrants. – granted amnesty to illegal immigrants who entered the United States before January 1, 1982 and had resided there continuously. So, Rep. King and all you GOP jerks, why is it OK for Ronald Reagan to grant amnesty to illegal immigrants but not OK for President Obama to stop the deportation of illegal immigrants brought here as children? Thank you for standing up for what is right! Obama thinks he can thwart the constitution,, Of course ILLEGAL aliens could care less about our constitution! Who will pay for these leeches school? Medical care? Who will pay the million AMERICANS unemployment because these peole took their jobs..
How does Obama brainwash so many self professed "smart people"?? IMPEACH OBAMA NOW!!! OIW Obama isnt working!! Yes we are all immigrants LEGAL immigrants! we didnt swim across the river or hike through the desert ILLEGALLY.. Send all of these leeches home and let them go throgh the legal process if they want to come here.. If we keep giving amnesty the united states will become just like mexico and they will have the voting power to do it! wait until they vote to change the official language to MEXICAN then maybe we will wake up!! Obama lost mine forever and so did the Democrats. We all know this is a desperate move by Obama to get votes from the Latino community. Most of us understand that. But my fear as it is with some other Hispanics, does that mean these illegals will be allowed to vote? Will he be able to include illegals in his vote tally – is he that desparte? Obama pulled the rug from under the Republicans due to giving millions of illegals amnesty? Just wait until you see the polls in the next few weeks!!! No matter how much the liberal media tries to sway opinion/votes regarding illegals–the majority, including the majority of Independents–do NOT want illegals given any form of amnesty!! And, just wait until the millions of unemployed and the middle class–are made aware that Obama has now given the millions of illegals the opportunity to take US jobs!! There are now even going to be millions of Democrats–even union members–who are going to turn against Obama regarding this issue alone!! This move by Obama is going to destroy him–and any other Democrat who supports his decision/actions regarding the amnesty for illegals!! In other words--all Republican, Independent, and moderate/sane (blue dog/Reagan) Democrats voting against Obama, versus the liberals!! Look, here is the bottome line, Its illegal for Obama to do this. It dosnt matter whether or not you want illegals to be here or not he can not legally do this he has no authority to do this granted to him by the constitution. If this move stands then we no longer reside in a democratic republic but a dictaotorship. This would set the precendent that Obama or any president could simply do what ever they want irregardless of the other two branches of govt. You know that little thing called checks and balances? Congress voted on this same idea three times and three times elected officials represeting their constituants voted no. Thats how it works. Look at it this way. What if he said for now on we are going to be part of the Euro and relinquish our control of our country, or that he was raising taxes on every single person in the U.S to fund whatever he wants? This is a prime example of a "slippery slope". If he can do this unilaterally he can do whatever he wants. Really appears now that there is a very good reason why his college transcript is protected and never seen, he more than likely got C's and D's in Constitutional Law.